Being able to take an accurate bearing is a very useful skill – it allows you to navigate well in fog, or in fairly featureless areas. A control will often be sited in a depression or a pit so that you have to actually be looking into the pit before you see it, so being accurate with your bearings is vital. 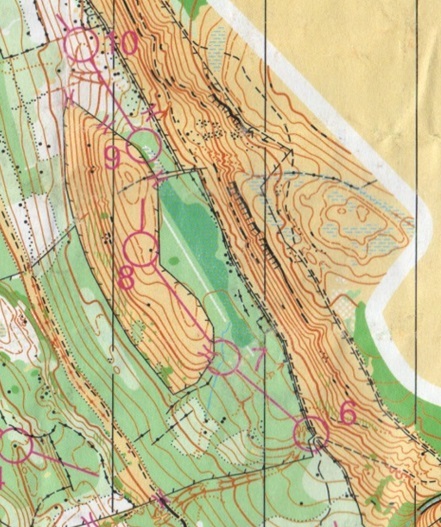 For example, going from control 6 – 7 on the M16 course at the NI champs in 2012, I used a bearings to help me accurately reach the point. There were lots of eye level branches in the forest, so it was difficult to see any features. Depending on your compass, you then need to do different things. If your compass has a rotating housing, rotate it so that the needle is between the two red lines. If not, remember the colour or number that the needle is pointing to. To run on your bearing, keep the compass needle between the lines, or at the same number or colour, then raise it to eye level. Look along the direction the compass is pointing and pick a recognisable point eg a tree, rock, hilltop, crag etc. Run towards your chosen point, but keep checking your bearing to make sure you are running the right way. When you reach the point you picked, pick another and continue, or continuously pick points so you never need to stop.